I've been acquainted with Teresa Baxter for several years now. And I've always been impressed with her tenacity and drive to promoted 'fair trade' in Southern California. For this reason, I asked and she agreed to be interviewed for the Dunitz & Company blog. Guess what? I learned more about Teresa than I'd previously known! NANCY: You've been an advocate for 'fair trade' for a long time. Can you tell me what inspired that? How long have you been fighting for this cause? 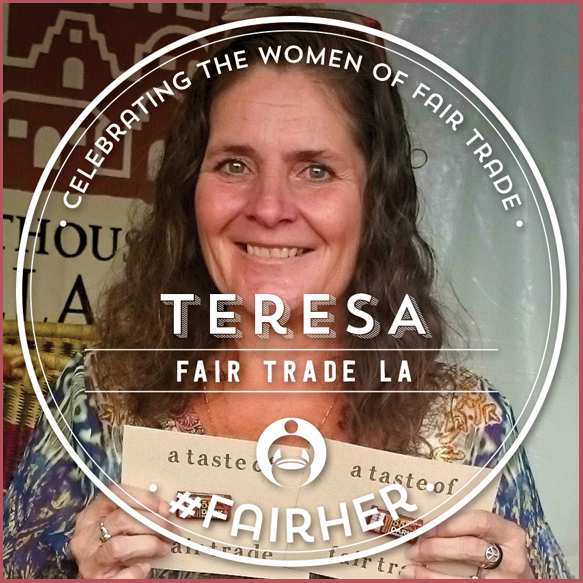 TERESA: I discovered my fair trade mission when I began volunteering at Ten Thousand Villages Pasadena when the non-profit store opened about 12 years ago. This took me back to school, earning my BA degree in International Relations from Columbia University and State University of New York. While in New York, I became the Publicity Coordinator for HandCrafting Justice, then an international fair trade project of the Sisters of the Good Shepherd. [Note: HandCrafting Justice closed their doors in January 2016 and had been long time members of Fair Trade Federation.] I was also active with the New York City Fair Trade Coalition. My passion didn't stop there. I lived in Alexandria, VA for a year and while there, I was involved with Fair Trade Town Campaigns. I helped Alexandria obtain their 'fair trade' designation. I'm happy to be back continuing my mission of service in Southern California. NANCY: We met when I first joined Fair Trade Los Angeles several years ago. You were the social media maven for the group. What is your background that gave you the know-how to do this? TERESA: Social Media was part of my publicity position at HandCrafting Justice, where we had over 3000 followers on Facebook. I have a nose for fair trade news, and I used social media to share all of the global good many on the same mission were accomplishing. It was also a great vehicle to promote all of our events and social justice projects. Ad Age Magazine even featured an article on us. NANCY: And now I know you're actively involved with Fair Trade Long Beach. Can you explain what roll you've taken on with this group? 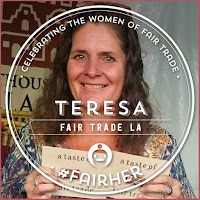 TERESA: We are a strong group of activists pushing forward our wish to earn Long Beach a "Fair Trade Town" designation. There's a lot of groundwork identifying retailers and organizations that promote fair trade. This also entails getting media coverage and interacting with the city council to promote and commit to passing a resolution advocating for fair trade principles. NANCY: Describe some of the important projects you are working on. TERESA: Fair Trade Long Beach holds monthly meetings that keep growing in attendance, so much that we grew out of our meeting space. We are currently looking for a larger venue that shares our values. 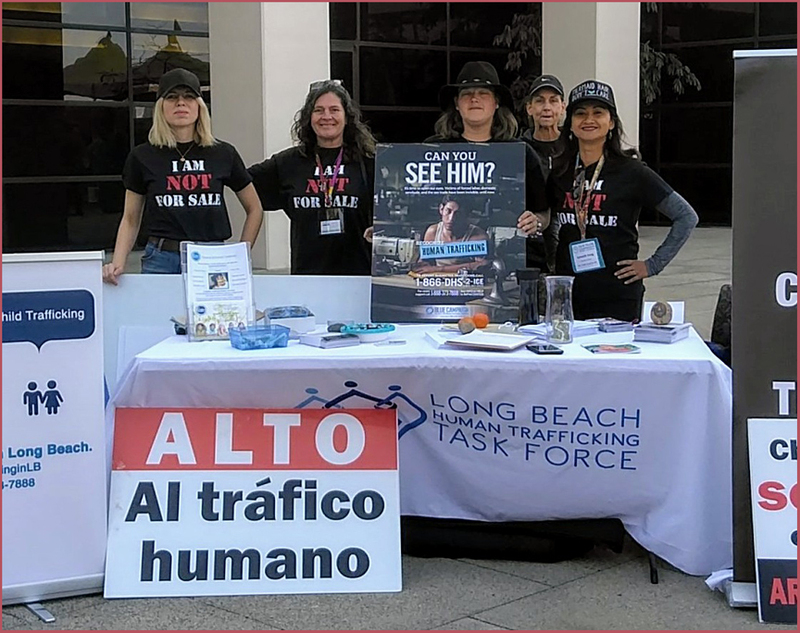 Our strongest partnerships are with Long Beach Human Trafficking Task Force and the local Salvation Army. We previously participated in a 'youth empowerment safety symposium' promoting awareness against human trafficking and showed how fair trade helps battle this fight. 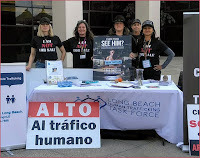 Most recently, we participated with the Task Force and Salvation Army with a table at the start of the Toyota Grand Prix of Long Beach. Our campaign "I Am Not For Sale" was all about educating the public. NANCY: Can you tell me a little bit about Fair Trade Campaigns and how it will make a difference? TERESA: Some of our team represented our [Fair Trade Towns] campaign at their national conference in Washington DC. I represented us [Fair Trade Long Beach] at the recent Fair Trade Federation conference in Denver. The takeaway for most of us was how much stronger we are collectively. We know that together we can accomplish great acts toward a more just world. One of my favorite quotes from Margaret Mead seems to capture our spirit. "Never doubt that a small group of thoughtful, committed citizens can change the world; indeed, it's the only thing that ever has." 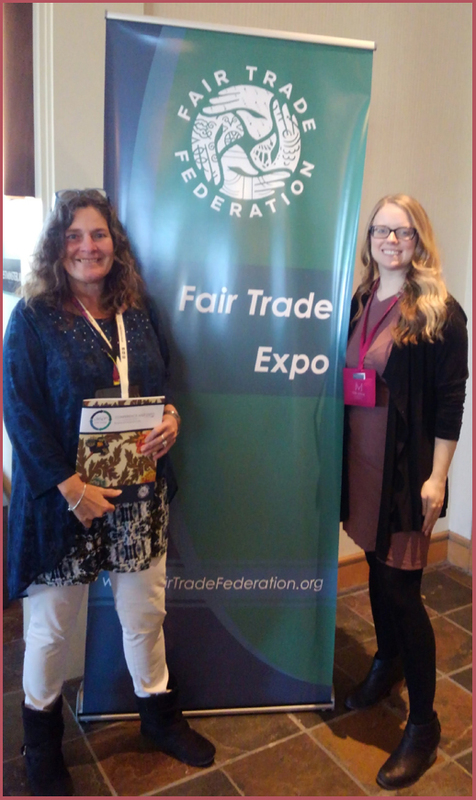 Note: I love that Teresa is pictured here with Rachel Spence, the Engagement Manager at Fair Trade Federation. I interviewed Rachel in December, 2017.